There are certain pieces of clothing I pull out of my closet time and time again. Not because I lack clothing, by no means! By virtue of loving them so much. I’m speaking of Christopher and Banks Essential Tees. Essential is the perfect word to describe these, because that is what they are...Essential. I have never had such comfortable Tee shirts. 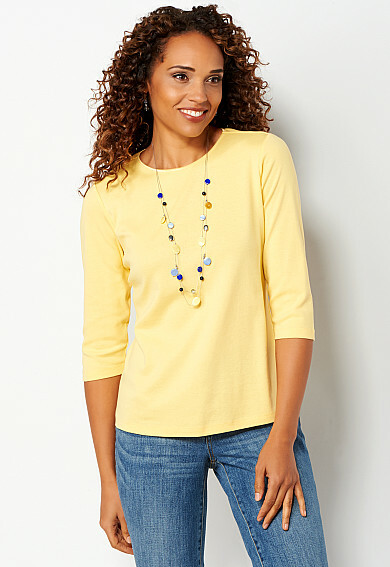 So easy to wear with jeans, shorts, or khakis. Pair them with a jacket, blazer or by themselves. Dress up with a scarf or long necklace. There are a wide variety of colors and styles. I prefer the 3/4 sleeves. It’s wonderful to hide those flabby arms. Yes, I have those too. They wash very well. I’ve bought cheap Walmart Tees that have lost their shape after one washing. These will not do that. I have some that are a few years old and they still look good. They seem true to size as well. I’ve ordered online and haven’t had any problems in the fit. If you are looking for some Tees for the summer, check these out. I highly recommend them. Sometimes they will have a two for $30. So they are very affordable. Another new item I found for this summer is a pair of Lee Capris. I loved these immediately, which is saying a lot. It’s difficult and tricky to shop for pants. They have a stretchy waist band which is so comfortable. I would say they are true to size. At least my size. Which again is saying a lot! As you can see, there is a wide variety of colors. I did not buy mine at Kohl’s. My local farm store, (Big R) sells Lees and I bought them there for less than $20. So you could probably find a good deal other than Kohl’s. Anyway, I hope these two suggestions aid you in your search for summer clothing. On another note, it has finally warmed up here in Indiana and I have hit the ground running. In fact my legs made their first appearance this past weekend. They need help.